Who can name the students in the photo? I got 13 of them from memory - not too bad. I've got about the same number and can place the face but not the name on several others. 24 kids -- seems like a lot, huh? Baby boomers, indeed. I thought of him when I saw the Sopranos episode where Paulie Walnuts does a number on Christafuh's lawn. Who out there has been married the longest to the same person? Any high school sweethearts still married to each other? Rob Vaughn -- 31 years. 27 for us-- but we just celebrated the 30th anniversary of our first date, Feb.22. Looks like Rob has the edge here-- plus grandchildren! I didn't even get married until I was 46. I had a very long adolescence. As I've yet to manage that commitment once ... can I chalk it up to being a (very, very) late bloomer? I think Mark would chalk it up to being sensible. I have been married for 25 years, but I know my bride has been praying for and actively cherishing the notion of my death for no less than 23 of them. So maybe this makes 2 then. In any event, if I disappear unexpectedly, thank God the 6 people on this website will know the truth. My high school sweetheart ditched me within six months. Is there a musician handicap? Debutantes weren't exactly clamoring for my hand in marriage. The great thing about marriage after 50 is that your gradually waning hormone levels assure a greater likelihood of chastity. Although John Hammell might have something to say about that. I can now listen to what a woman is saying to me without breaking out in a cold sweat. Re waning hormone levels- I started taking bioidentical testosterone 6 months ago after reading Suzanne Somers excellent book "Ageless- the Naked Truth About Bioidentical Hormones" and its an amazing feeling to once again feel the same outrageous energy levels as I remember from early 20s! I just got engaged to a 37 year old who is the woman of my dreams. (I've never been married) and am very happy! We want to have kids. One of my clients is the Life Extension Foundation www.lef.org and I have learned ways to slow, even reverse the aging process, but its not hard and anyone can do the same things! Am hoping to live over 100 and be in good health, so I'd like to issue a challenge: lets see who's still kickin' in another 30 years! What I like best about this is I had a lot of serious health problems when I was younger, a tree fell on me in a tornado when I was 16 and I was lucky not to buy the farm then- then I was driven from college by schizophrenia and recovered 30 years ago via orthomolecular medicine, a suppressed alternative medical treatment involving vitamins- see http://iahf.com/on_the_back_wards.html I met my wife to be via her surfing onto my personal story while searching for help for her brother, so I'm very glad I put it into cyberspace! Good things come to those who waiteth, as long as those who waiteth worketh like hell while they waiteth! Will be fun to come to this reunion! Please, not that. I'm just getting over the fact that I never "hooked up" with anyone in HS. Apparently some did. Where the hell was I? I see a few folks from" the grand ole Washington School". Does anyone have any pictures from those prehistoric days? Yeah, APB out for Lincoln School pics. This is the only one I've seen so far. I have my mom looking through her archives. Hi Scott- I actually do have some photos from when we were in Washington School, but I'll have to scan them to upload them. I have one of you and I in my parents stationwagon when we were about 8 years old the summer we went up to Camp Wawayanda in the Catskills. 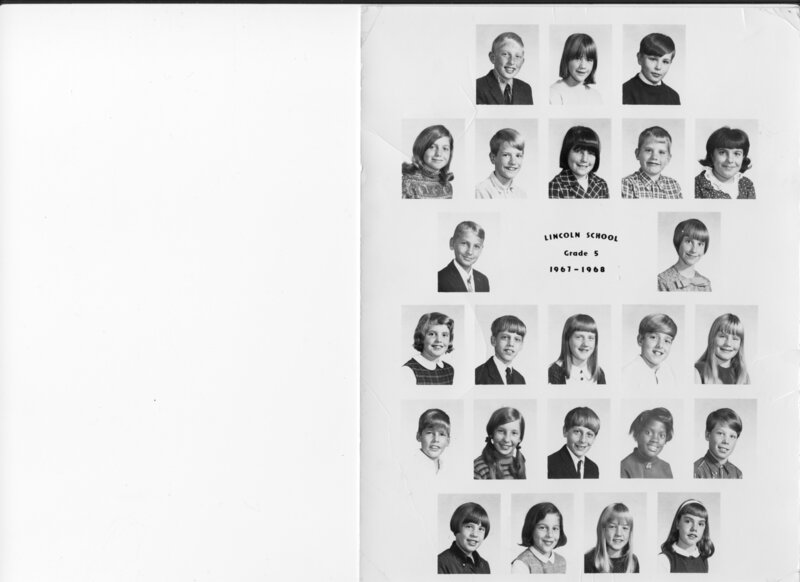 I have the one of our 6th grade class at Washington School and some others from when we were that age. Thats great to see you're doing well. Any idea how Tom Kelly is or where he is now? My brother Rob died in December. Was quite a shock, he was only 63, but an aneurism nailed him. I hope your brother and sister are doing well. Are either of your parents still kickin'? Mine both died, dad in '92, mom in 2001. Mom fell asleep at the wheel of a car and barrelled into a tree. She lived 4 years past that after coming out of a coma that she was in for a year, but never walked again. When I get a chance, I'll scan some of the old photos to upload here. James. Looks like you got pretty sensible in your middle age years. Oversized appliance boxes not withstanding. It's all a facade. I'm at heart quite irresponsible and immature. Well, certainly immature. What almost 52 year old dad would tell his three year old son that he's getting poopy on a stick in his lunch box? The smart ones never grow up. That's why we chose music. So we wouldn't have to be mature. The Lawn King John Colton is correct! Terry, great memory. The only one I may or may not be able to add is to the left of Susan Roessle. Is that Todd Reynolds? Yes, it is Todd. To your right is Chip Ward. Way to go Terry. Right...Chip Ward. I use to hang out with him when we were pretty young. His mom was a very good artist if memory serves. OK, who remembers who was dating (going steady with) who in elementary school. Can we even remember? Ah, those first steps. Terry, I do seem to remember you and I went steady for a day in 5th - not even. Strange the memories you have. I remember (that day) we were in the cafeteria and I was reinventing my milk carton in some manner. You sat there and watched for a while, not amused and after a while said something to the effect of "You really like to play with things hunh?" That was the end of that. At such a young age we instinctively understood the more mature concepts of compatibility. No need to waste time in the wrong relationship. One day? That'll do just fine. To this day I think it's the shortest relationship I've ever had. Well that may not be entirely true... I remember chasing Toni Christ around one afternoon after school (totally out of character) determined to get her to take my ID bracelet. She finally acquiesced just to get me to go away. That one didn't last very long either if memory serves. Lincoln School - I seem to recall hearing John Combias was going to give me his ID bracelet but then he decided to give it to Holly Penwell instead. What a crusher. There is a funny story about Mom and Peter finding out about John. They pulled into his driveway to have a conversation with his parents over his intentions!!!. I was in the backseat of the station wagon (remember those?) and had managed to crawl underneath the driver's seat in complete mortification and horror. Alas, they were just teasing me and we drove home. Ah, the memories of youth!!! On the Brayton School side, Chuck Wiebe went steady with Marieclaire Odell. I want to say Jim Flanagan went steady with Sarah McNear, but maybe each went steady with someone else. Now I want to say Jim Flanagan and Chris Roller. I certainly wanted to go steady with Sarah McNear, however. I remember a dream I had about her in 5th or 6th grade. She appeared before me naked, knock-kneed, and wearing penny loafers. Nothing else happened because I was not too clear on what was supposed to happen. The going-steady crowd used to traipse to Elephant's Grave to make out back in 4th or 5th grade. I used to tag along mainly because I was pals with Chuck, even though I had no one to make out with. We had to get out of there well before dark, however, because rumor had it that the "hoods" came there at night with their girlfriends. Making out in 4th and 5th grade, huh? I missed out on that scene entirely. Must have been too busy trying to make it all the way around Deafy Lee Pond, which was no easy feat back in those days. Invariably we'd get lost in the woods. Now that neighborhood is full of houses. Bummer. Man, the Brayton School gang was ahead of it's time. I don't remember making out in 4th and 5th, unless, again, there was stuff going on behind my back. I was frightfully naive back then. Other than Melanie Wall nailing me in the 3rd grade, my first kiss was Penny Diehl (sp?) in 6th. I think we werer playing manhunt (remember that?) at Beth Maher's house and the object was to find your girlfriend (who made herself easy to find) and go off in the bushes somewhere and makeout). I remember sitting in the bushes with Penny. We just looked at each other, neither one making a move - scared to death. Making out in earnest began in 7th for me. Many parties in the basement with red light bulbs listening to CSN. Good memories. Playing manhunt with the Kenyon boys and the rest of the neighborhood, sure. Anyone remember getting a pink belly? Isn't that what it was called when you were held down and your stomach was slapped silly? I remember being the recipient of a pink belly and my stomach was fiery red for days. Didn't we all run around in packs trying to catch lightning bugs, too? How about some country club swim team memories and playing Line Tag or Marco Polo until your toes and fingers were shriveled up because you were in the water for hours on end? I was on the Clearwater swim club swim team when I was 6 for an entire 10 minutes. I'll never forget this because I remember a practice relay race in which I could barely swim the length of the pool without drowning, and the guy at the other end slipped off the block and dived smack dab into the middle of my back driving me under when I was on my last breath and I damn near drowned! The lifeguard fished me out, and that was it for me and swim teams til 3 years ago when I got into Masters swimming which I really enjoy a lot! I wish I hadn't let what happened when I was 6 scare me away from competitive swimming for more than 40 years because its a tremendous sport that you can do your whole life being so easy on the joints. The oldest person in my Masters swim club is 86 and he still competes in the meets! I hope I still am when I'm his age. Is there anyone else on here who remembers Clearwater Swim Club? I have lots of great memories of that place, the watrer was a wonderful temperature being from Artesian wells, and I remember playing countless games of "Marco Polo" in the deep end, and spending hours there in the summer. I also remember sneaking in at night one time our senior year with a handful of other people, and the thrill of possibly getting caught by the police made it a lot of fun! I also remember sneaking in to Commonwealth Water Companies Reservoir to go fishing and being chased by security guards! We used bolt cutters to cut a hole in the fence, and we put the cutout part of fence back like it had never been cut. Just as the security guard thought he had use nailed, we burst through it to maintain our freedom! I also remember this one kid whose dad was a cop. He had a bunch of fishing tackle that his dad had confiscated from other kids who'd snuck into the Rez. The group I was with got really pissed off at him and wouldn't stop razzing him til he left. Anyone remember Tom Pedler and his infamous tree house down by the River? He kept stolen goods in it and had tapped the high tension power liine from Jersey Central Power and Light to have power for his elevator that got him up and down the tree and into the thing. He heaved a rock at me, I heaved one back and broke his jaw, cheekbone and eye socket. When he got out of the hospital he tried to kill me with his car, and used to ride by our house with a bullhorn yelling insults. I lashed a dead carp to the underside of his muffler with baling wire so it would stink like hell from the heat from the muffler which caused it to decompose to retaliate after he stole my bicycle and my brothers. How the hell did any of us ever survive those years??? Seeing Terry here (hi, Terry!) and then you mentioning Beth Maher and Toni Crist reminds me of what a power trio those three were in seventh grade. Our Charlie's Angels. The three of them always hanging together drove us newly pubescent boys wild. Well I remember the names of eighteen of my classmates in this photo. The lawn king included. Don and John were both the ;Lawn Kings. I am glad that I was a well behaved fifth grader. Yes, the face of an angel. But we know better. Can you still fit under a mailbox? I don't think I can high jump any hedges anymore. (our first juvenile arrest in 7th grade - crime? - sneaking out past our curfew to go see Carol Graef and ????? The parents were not happy when their phone rang at 2am! Hi, by the way the guy with the "deep voice"
On Spouses...Terry. My family, being music lovers, knew of the Carlinis. I'm pretty sure my sister took piano lessons with John's mom. I remember my mom telling me of John's successes. I was in Houston and she figured I'd be interested to know that someone local had done so well. I enjoyed visiting John's website. Very impressive. I was surprised to see he had gravitated to Blue Grass. When I used to tour with Jimmy Messina we used to listen to Flat and Scruggs and others on the tour bus. Who knows, I might have even been listening to John! That music always makes me feel happy. Great memories. I don't have much of that music in my music collection, save for Alison Krauss & Union Station. I got to sing with Alison on Leno. Great experience. Tell John the Atkinsons are fans of the Carlinis and I am now a fan of his. And you...I see you made a wise decision and married a musician. I'd like to take credit for breaking the ice and paving the way. If it hadn't been for our one day 5th grade fling in the cafeteria you might never have recognized true love. PS I'll be John played with his milk carton in 5th. Come to think of it, I guess he was playing "The Auctioneer" and "Hound Dog" on the guitar while I was playing with my milk carton. - Best to you both. Does anyone know how many of our classmates are no longer with us and who they are? We have heard the sad news of the loss of several classmates and plan to honor them at the reunion. I'd rather not list classmates on this blog, however. It would be nice for us to have an In Memoriam link and we'll work on that idea as we continue to build the web site. We need to be careful not to list the name of someone who is still with us, for example, Peter Laughlin, who looks deceased, but is rumored to be around somewhere. Disclosure statement: I did not write the above entry; however, I was in the presence of the person who did. I would ask you all kindly not make fun of me when they wheel me into the reunion party on a gurney. Just stick me over in the corner and tilt me up like Hannibal Lector. Wow, I didn't know you guys were going to upload our highschool pictures. No wonder I never went to the prom!! It's great to hear stories that bring back great memories. I am writing to express my profusely teary eyed reaction to the wonderful Lincoln School photo. And why am I teary eyed? Glad you asked. I went to Roosevelt Elementary School, in East Summit, with all the rest of the poor kids/impending criminals and total luzers. Posting our class (inmates) picture would only invoke more pain and sorrow, as so many of us have either been killed in gun battles or are still in da big house with no hope of parole. I am proud, however, to report that I think I could identify most of my classmates, like Leonard Melni, not by name, but by State ID number. But I am not bitter at our plight, and I am happy for all those law abiding, God fearing Lincoln School kids who are living the good life. I hope to be free someday too, after I can convince the NJ Parole Board that I am truly sorrying for being a serial liquor store robber (I had a thing for twist top peach flavored Muskatel, which is my libation of choice). Perhaps that Lincoln School alumni, Peter Laughlin (now a scummy lawyer) will do a few moments of pro bono work and get me outa da big house. I can be reached at tony.pannella@RahwayStatePrison.com for those of you who miss me. Tony, I read your teary eyed response with a heavy heart. Had I only known you were doing time in the penitentiary I could have pulled some strings at the highest levels of government. After all, my blue blood Lincoln School connections have landed me every music gig I ever got, from the back woods hick joints in Texas to the high profile Ramada Inn gigs in Alexandria Louisiana. But I must say I'm sorry you feel that way about privaledge. Us Lincoln School kids are so misunderstood. Most of us have spent time at the Betty Ford Clinic for debilitating delusions of grandeur. Between Willy Wilson envy and a complete inability to relate to our fellow Americans, being a Lincoln Schooler has been no picnic. In fact it has been a rough life for the lot of us and I think I can speak for all of us when I tell you that fame and fortune is not all it's cracked up to be. No, consider yourself lucky indeed you did not attend Lincoln School. Your present internment notwithstanding. - Respectfully, Bruce.